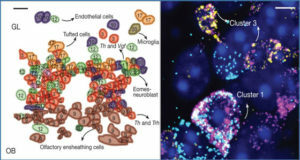 Retrieving high-content gene-expression information while retaining three-dimensional (3D) positional anatomy at cellular resolution has been difficult, limiting integrative understanding of structure and function in complex biological tissues. 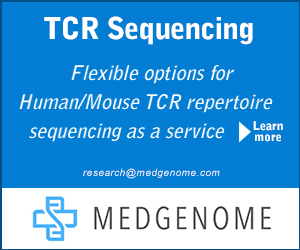 Stanford University researchers have developed and applied a technology for 3D intact-tissue RNA sequencing, termed STARmap (spatially-resolved transcript amplicon readout mapping), which integrates hydrogel-tissue chemistry, targeted signal amplification, and in situ sequencing. 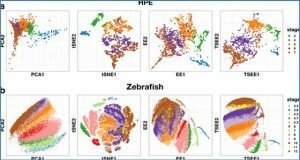 The capabilities of STARmap were tested by mapping 160 to 1020 genes simultaneously in sections of mouse brain at single-cell resolution with high efficiency, accuracy, and reproducibility. 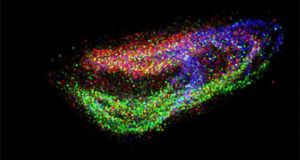 Moving to thick tissue blocks, the researchers observed a molecularly defined gradient distribution of excitatory-neuron subtypes across cubic millimeter–scale volumes (>30,000 cells) and a short-range 3D self-clustering in many inhibitory-neuron subtypes that could be identified and described with 3D STARmap. (A) STARmap overview schematic. 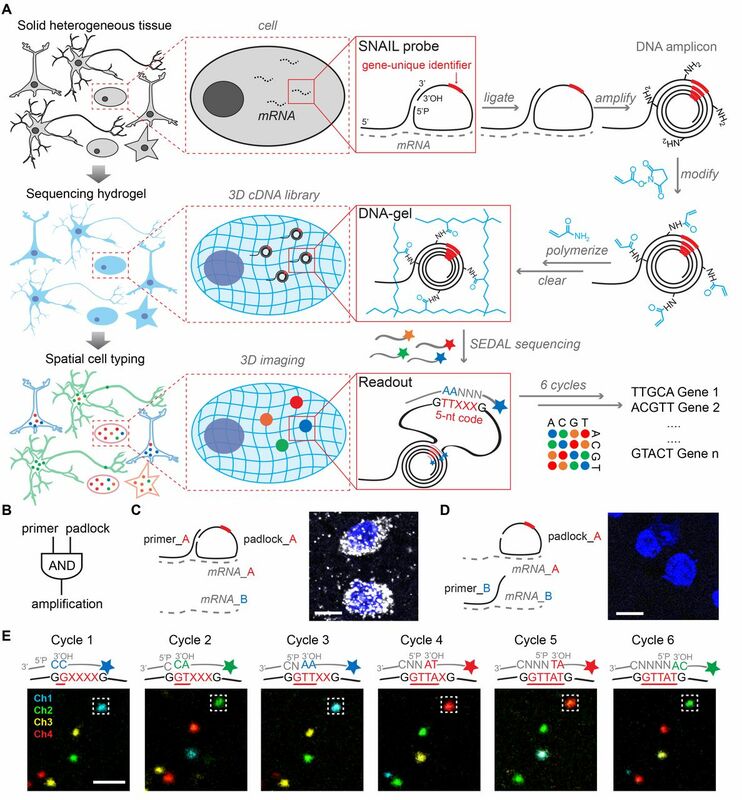 After brain tissue is prepared (see Methods for mouse brain protocols), the custom SNAIL probes that encounter and hybridize to intracellular mRNAs (dashed lines) within the intact tissue are enzymatically replicated as cDNA amplicons. The amplicons are constructed in situ with an acrylic acid N-hydroxysuccinimide moiety modification (blue) and then copolymerized with acrylamide to embed within a hydrogel network (blue wavy lines), following by clearance of unbound lipids and proteins (fig. S2). Each SNAIL probe contains a gene-unique identifier segment (red) which is read-out through in situ sequencing with 2-base encoding for error correction (SEDAL) (fig. S3). 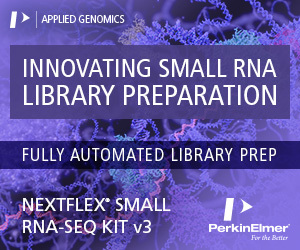 Finally, highly multiplexed RNA quantification in 3D reveals gene expression and cell types in space. (B) SNAIL logic: a pair of primer and padlock probes amplifies target-specific signals and excludes noise known to commonly arise from non-specific hybridization of a single probe. (C and D) Only adjacent binding of primer and padlock probes leads to signal amplification. 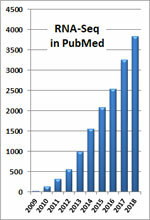 mRNA A represents Gapdh and mRNA B represents Actb. 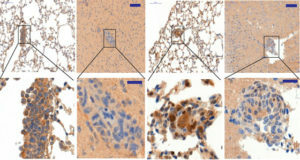 Both fluorescent images showing Gapdh (gray) mRNA and cell nuclei (blue) labeling in mouse brain slice; note the absence of labeling with mismatched primer and padlock (right). Scale bar, 10 μm. (E) In situ sequencing of DNA amplicons in the tissue-hydrogel complex via SEDAL, the novel sequencing-by-ligation method devised for STARmap: for each cycle, the reading probes (gray line without star-symbol label) contain an incrementally increasing-length run of degenerate bases (N representing an equal mixture of A, T, C and G) with phosphate at the 5′ end (5′P) to set the reading position; the decoding probes (gray line with star-symbol label) are labeled by fluorophores with color coding for the dinucleotide at the 3′ end. 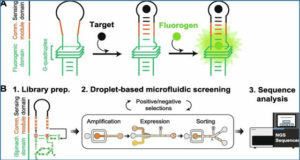 Only if both probes are perfectly complementary to the DNA template (black lower sequence), the two kinds of probes can then be ligated) to form a stable product with high melting-temperature, allowing later imaging after unligated probes are washed away. 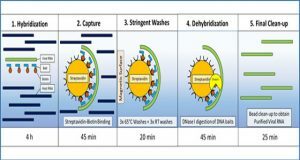 After each imaging cycle, probes are stripped away from the robust tissue-hydrogel using 60% formamide so that the next cycle can begin. X: unknown base to be read; red underline: decoded sequence; Ch1-4: fluorescence channels. Scale bar, 2 μm.